It all started with an execution. In 1611 the Italian Count, Giovan Battista Masi, was arrested for plotting against the rule of Ranuccio, Duke of Parma, a member of the prestigious and influential House of Farnese. On pain of torture, Masi eventually confessed to his treachery, and was later publicly beheaded in Parma’s town square, along with six other conspirators. As was common in such cases, officers then moved in to confiscate his property . There, among his private possessions, they came across a painting. And it was not just an ordinary painting – it was a late masterpiece by the celebrated Netherlands artist Pieter Bruegel the Elder. It is this painting, The Blind Leading the Blind -- a work that has been described as “one of the finest pictures ever painted”  -- which is the subject of our story. The Blind Leading the Blind -- also known as Parable of the Blind -- is a large painting, completed by Bruegel in 1568, the year before his untimely death at a comparatively young age . It portrays a line of five blind men, in progressive stages of losing their balance, following the fate of their blind leader, who has already fallen into a stream. We see him, dramatically foreshortened, wallowing on his back , still holding his hurdy-gurdy, the musical instrument commonly associated with beggars. The men have evidently been making their way along a path leading from a village. They are linked together by wooden staves and are guided by placing their hands on the shoulders of the next man in front. On the far left, we can see the outskirts of the village. In the background, beyond the extended gap between the fourth and fifth men, there stands a church. The countryside in this background is probably based on the Pede Valley, south-west of Brussels, an area which Bruegel regularly visited. Indeed, the church in the painting is strikingly similar to St Anna Pede at the village of Dilbeek, which still stands there today. Originally, to the right of the church in the painting, there was also a small cow, a herdsman and some fowl near the tree. These are now not visible, having been abraded at some stage in the past. However, we can get an idea of how they looked from early copies of the painting made by others, such as in Fig 3. The concept of the blind leading the blind was referred to in the Bible, where Christ, referring to the Pharisees, says, “They are blind guides leading the blind and If the blind lead the blind, both shall fall into the ditch” . It was also a well-known Netherlandish proverb. Proverbs were extremely popular in Bruegel’s day, and he often illustrated them, most notably in works such as Flemish Proverbs (Fig 4). Bruegel also appears to have been very interested in the specific topic of blindness, depicting it in that same painting, where there is a tiny group of three linked blind beggars in the far background, and in a number of other works . Specific illustrations of the proverb, with a line of beggars progressively falling, had earlier appeared in an engraving by Cornelius Massys . However, Bruegel’s work is the earliest known painting​ of the subject. The concept of a line of people heading towards their inevitable fate also has echoes of the traditional Dance of Death (Danse Macabre), in which persons from various walks of life dance along towards the grave, a reminder of the fragility of life and the vanity of earthly glories (Fig 6). It also has a modern echo in John Singer Sargent’s painting of a line of soldiers blinded by a gas attack (Fig 7). In 16th century Europe, blindness was very common, due to poor standards of hygiene and the lack of effective treatment. In physical terms, diagnoses and remedies were rudimentary at best. Eye troubles were customarily ascribed to toxic vapours that rose from the patient’s stomach and leaked into the brain. Remedies tended to be hopeful rather than effective -- one, for example, was to “have someone blow in the eye gently with a breath sweetened by chewing cloves or fennel” . 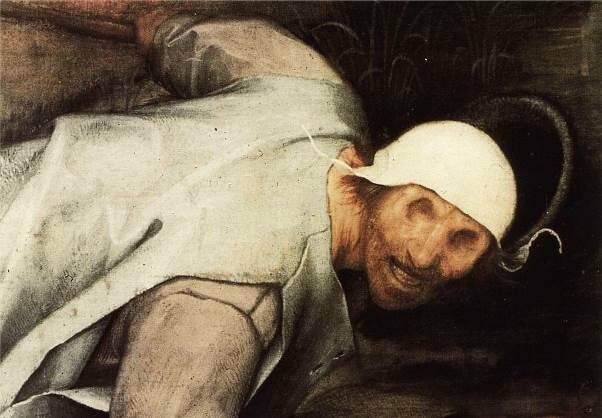 Given this general background of ignorance, it is all the more striking that Bruegel has depicted the men as individuals with highly specific types of ailment, in contrast to earlier depictions of the blind as generic-looking characters with closed eyelids (see Fig 5). In fact, Bruegel shows the ailments in such clinical detail that later commentators have been able to make informed attempts at diagnosing the precise conditions that most of the men are suffering. So, for example, starting from the follower on the far left, we have a case of pemphigoid (scarring of the conjunctiva); a non-identifiable ailment obscured by the second man’s hat; phthisis bulbi (shrunken non-functional eyes); corneal leukoma (wall-eye); and enucleation (removal of eyes) in the case of the man turning sightlessly toward the viewer . ​As a further sign that Bruegel has closely observed actual blind people, he perceptively shows some with their heads raised characteristically in the air, as if they are trying to rely on other senses, such as smell or hearing. Bruegel’s unsparing realism counters the suggestion that he is exploiting common attitudes by using comic suggestion to get a cheap laugh. The element of restraint is also underlined by Bruegel’s avoidance of strong or bright colours, preferring to use more delicate tones such as mauve, grey, and subdued greens . 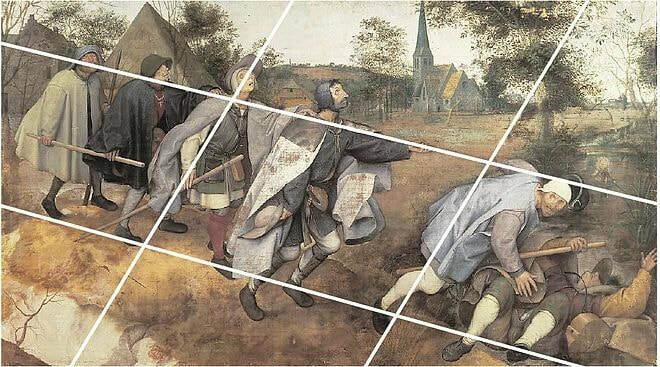 While earlier traditional depictions of the topic had a rather static feel, Bruegel has been able to achieve a strong sense of movement by positioning the men along a descending diagonal from the left. The men are linked by outstretched hands and wooden staves, in increasing stages of imbalance, like a line of toppling dominoes. Starting from the left, the first two men are still unaware of their fate, while the third is just starting to sense something is amiss. The fourth man, who has lost contact with the person in front, except for feeling a violent pull on the stave, is clearly feeling worried. He appears to be turning his head toward the church, possibly in a form of hopeless supplication. The fifth man turns his face toward the viewer, revealing his empty eye sockets, with an expression of horrid realisation , his expression almost recalling a Boschian damned soul. 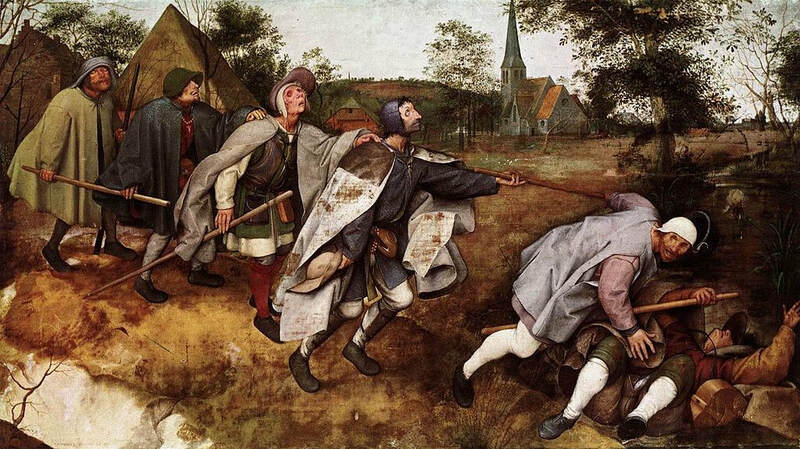 The comparatively large number of participants, again contrasting with earlier traditional representations, increases the dramatic effect, as well as magnifying the inexorable nature of the fall, and gives Bruegel the opportunity to display his remarkably advanced observational skills, of both blindness and the physical process of falling. He uses a number of artistic tricks to reinforce the sensation of inevitable fall  -- the physical linkage between the men, the downward slant of the path, the increasingly forward angle of their bodies, accentuated further by the downward slope of the roofs, the sloping positions of the men’s staves, the men’s varied head positions and the relative darkness of the bottom right of the painting. In discussing the composition of the painting, Charles Bouleau has noted that “there is a set of parallel oblique lines which join some of the points dividing the sides of the picture into nine equal parts; other oblique lines, each at a constant angle to the first ones, form another network; it is these angles that give to each of his pictures its peculiar rhythm” . In Bruegel’s time, blindness was commonly associated with criminality, as it was often a prescribed punishment for offences. It was also associated with moral depravity, as it was believed that God used it as a punishment for sin. Furthermore, as blind people typically could not work, and there was no effective social welfare, they often had to resort to begging or dishonesty to survive, so attracting further opprobrium . In general, therefore, the men could not be expected to elicit much sympathy from the public -- Bruegel’s audience would typically have regarded them as untrustworthy social outcasts associated with criminality and moral wanton natures . So far, we have been considering the painting simply as a literal exposition of the proverb, that poor leadership leads its followers astray. But does it have some deeper meaning, and if so, what is it? At this distance, it is notoriously difficult to determine these questions with any certainty, especially with Bruegel’s works, which are notorious for laying themselves open to multiple, sometimes mutually-contradictory interpretations . But this should not deter us from examining some of the interesting possibilities. It may be, for example, that Bruegel is suggesting that these men are not only physically blind, but are also spiritually blind. This is of course highly likely, given the Biblical source of the proverb which is being illustrated. In this sense, their fall can be seen as a fall into sin. It may also be relevant here that the men are garbed in the traditional outfit of pilgrims -- cloak, hat and staff – and the second man from the left is wearing a crucifix. This concept of blind pilgrims was actually a common one in the Netherlands at the time . However, if they are pilgrims, it is likely that they were intended to be understood to be “bad” pilgrims – those who are not really pursuing a quest of finding spiritual truth, but are only affecting the outward signs of faith. This suggestion of spuriousness is reinforced by the fact that the men appear to be relatively well-dressed (though grubby) and some seem to have full purses, suggesting that they may not be what they appear. Pilgrims or not, if the men are spiritually blind, who is to blame for that? The simplest interpretation is that it is the men themselves, who deserve their punishment because they have literally and figuratively turned away from their spiritual leader, the Christian church . This would imply that the painting was meant as a reminder of the virtues of simple faith. But others have argued for wider, more challenging interpretations – that it is the church itself that is the blind leader, impotent to save its flock. In this respect, the physical positioning of the church in the painting has proved to be contentious with commentators: one has noted that this church one of “the most fought over in art history” . One interpretation is that Bruegel is suggesting that the church’s position between the group of two at the front, and the others, means that although the first two are already fated (both physically and spiritually), the church still offers some hope of salvation to the other four. Another, contrary, interpretation is that the withered tree which we can still just see in the foreground of the church indicates the decay of a dying faith. Yet another argues that the separation of the church from the men, and its inability to prevent their fall, is a sign of its impotence in a time of political and religious schism, an issue we discuss further below . Of course, however, it may just be that the church is simply an incidental part of the scenery, as commonly appears in Bruegel’s works, and that it has no particular significance at all. Yet another possibility is that the painting is intended to suggest that it is the government of the day which is blindly leading its followers astray. At the time when Bruegel was painting this work, the Brussels where he lived was the seat of the Spanish Netherlands, headed by the Duke of Alba, determined to suppress non-Catholic religions (Calvinists, Lutherans, Anabaptists) and enforce Spanish rule, through his “Blood Council”, with associated mass arrests and executions . This uproar was at a height, with religious schisms being rawly exposed. Possibly, then, Bruegel is subtly suggesting, by painting this particular topic at this particular time, that the Spanish authorities were acting blindly by governing their subjects unwisely and/or immorally . The future of the country, not just the future of the unfortunate men, therefore could be seen as yet another example of the blind leading the blind. © Philip McCouat 2018. First published October 2018. For more articles on Bruegel, see the box at the start of this article.